Thank you to Kimberley Elms and Fort Mill High School Athletic Booster Club for all you do. Go Jackets! 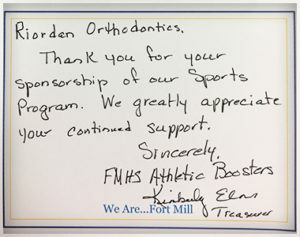 Riordan Orthodontics Supports Fort Mill High School Athletics! Riordan Orthodontics Supports the DBES Dragons!